WASHINGTON, DC, August 30, 2005 --Eleven EPA employee unions representing over 7000 environmental and public health professionals of the Civil Service have called for a moratorium on drinking water fluoridation programs across the country, and have asked EPA management to recognize fluoride as posing a serious risk of causing cancer in people. The unions acted following revelations of an apparent cover-up of evidence from Harvard School of Dental Medicine linking fluoridation with elevated risk of a fatal bone cancer in young boys. I doubt the cancer risk from flouride is anywhere near as high as that from cell phones or cigarettes -- but with fluoride, cancer is the tip of the iceberg. If this is the wedge for awareness, fine. "Also of historical interest is the item we came across describing how the Nazi concentration camps used fluoridated water to suppress the will and vigor of inmates. This appears to have been during the 1930's and was the first known example of fluoridated water supplies for a specific population. " "Two national environmental organizations, Environmental Working Group and Beyond Pesticides, joined today with the Fluoride Action Network in challenging the safety of new food tolerances issued by the EPA for the fluoride based pesticide, sulfuryl fluoride. This action marks growing concern among mainstream scientists and environmental organizations that total exposure to fluoride, from water, food, and dental uses like toothpaste and rinses, is not safe for vulnerable populations, particularly young children." Being a pesticide, fluoride is good for humans, kinda like DDT and RoundUp. Thanks DOW -- I'd like a triple, heaping helping of sweet fluoride. When I leave my supermarket apple in the fridge for two days, it smells -- like pesticide. (This experiment is repeatable; try it at home, with an organic control apple). This actualized evil will come to an end as the petrol age flickers out of existance. The big lie, repeated often enough, has become reality. No conspiracy necessary, the principles are all dead, but frankenstein lurches on, gently tossing flowers in the lake. There are some interesting observations to make when one considers the abject failure of Authority in this specific instance. Fluoride is so ubiquitous in American culture -- with a positive spin -- one must wonder what else the dentists have gotten wrong. Haha! It isn't just the dentists, of course. Doubtless one cannot pass the Tooth Bar in America without bending over for fluoride. As one begins to look for for examples of the Big Lie, there is no limit to how deep the rabbit hole goes. "One concern that has not been fully investigated is the link between fluoride and effects an the central nervous system (CNS).... Many years of ubiquitous fluoride exposure have not resulted in obvious CNS problems such as seizures, lethargy, salivation, tremors, paralysis, or sensory deficits. Still unexplored, however, is the possibility that fluoride exposure is linked with subtle brain dysfunction." "Experience with other developmental neurotoxicants prompt expectations that changes in behavioral function will be comparable across species, especially humans and rats. Of course behaviors per se do not extrapolate, but a generic behavioral pattern disruption as found in this rat study can be indicative of a potential for motor dysfunction, IQ deficits and/or learning disabilities in humans." 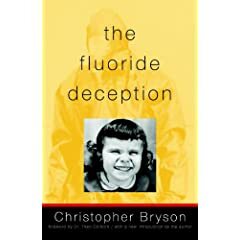 The authors draw attention to reports from Chinese investigators that high levels of fluoride in drinking water (3-11 ppm) affect the central nervous system directly without first causing the physical deformations of skeletal fluorosis.2-4 Readers of Fluoride will recall the recent (November 1995) research report from China indicating adverse neurological effects on the brain from fluoride exposure.5 This work also suggested that children with dental fluorosis are at greater risk of decreased mental acuity. One can only wonder whether the effects of fluoridated water might extend beyond the appearance of the teeth and include neurotoxicity among children afflicted with dental fluorosis. "Decreased mental acuity"? That's crazy talk. It'll never happen in these United States! I dunno if MSG is a byproduct, but it is definitely creeping into the general food supply -- kind of an MSG arms race to entangle the processed food set, which unfortunately includes me on most days. Seems to cause obesity and stupidity.